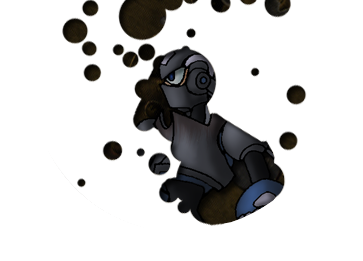 After an investigation into the cheap knock offs of themselves, the team discovers it was Doc Robot and the Wily Rescue Force behind the mess the whole time. Unfortunately the Force expected to be found out .... indeed, they were counting on it. They captured the team and it was revealed that the Force had teamed up with Nightmare Top, who was not only behind the theft of the Ark, but also behind the theft of Bizarro Shadowman's brain. All this was in an effort to create a monster robot called Frankenstein who was to consume the 'Maniacs and learn the secrets of their Transmetal 2 armor. N-Topman's plan was to have Frankenstein be his new body, but unfortunately for him the Rescue Force betrayed him. All Hell broke loose and, in the chaos, the Rescue Force escaped with N-Topman. Frankenstein, totally feral, began to ravage the city. Mecha Energy, released from his prison, joined the other beast in its destructive rage. And copies of the 'Maniacs began to manufacture themselves at an astronomical rate and began to pour out of hiding to cause even more chaos. In the midst of this destruction arrives the Special Forces ... robots based on the Gamma Armor created by Bizarro Shadowman in an attempt to control the 'Maniacs. And now the team goes to the chief of police in order to sort the mess out. The Mechanical Maniacs are now at police headquarters with Dr. Light. Geminiman: I can't believe you'd do this sort of thing, Master Light. Dr. Light: Well, it did seem like a good idea. Magnetman: I still don't see the problem. The Special Forces saved all of us. They did well. Hardman: You weren't stuck inside of those creepy robots, kid. I don't expect you to understand. Magnetman: I still think you're all overreacting! And talking to the police chief won't do anything but delay our battle! Magnetman: Why do we have to wait while people are being hurt!? Shadowman: We haven't been allowed a personal visit from the chief before this time and I don't think we would have been if we didn't have some leverage. I don't like it any more than you do, but I'm sick of being bossed around by someone I don't even know! Dr. Light: Megaman is handling things as best he can .... I hear even Bass is fighting the duplicates of yourselves for his own reasons. So far they're content with wrecking warehouses. Needlegal: Shadow, they do have a point. Shadowman: .... Fine. Sparks, Magnet, go and handle Mecha Energy. Between the two of you, things should be okay. The rest of us will be on standby until we see the chief. Police Bot: I warn you, the chief is somewhat .... temperamental. It's best not to upset him. Police Bot: Well, he's right through there. Crorq: Well, well, well. So you've come to laugh at me have you? Topman: Cr-Crorq!? You're the chief of police!? Crorq: *grunts* Yes, that's why I'm shackled here. Crorq: I've been through the humiliating experience of being reprogrammed! I feel so .... violated! They even took away my weapons. Geminiman: But ..... you're the chief of police!? You?? Hardman: Oh, GEEZ! What the Hell is this? Crorq: I have an eating disorder, all right? It's unkind to call attention to it! Crorq: Those Damned "Sinister Six" jerks rebelled against me! The ingrates..... I rebuild Torchman and convince the lot of them to re-start their taking over the world thing and this is how they treat me! * Those assholes injected me with a virus ... tried to beat me senseless. And then they tossed me off a cliff! When Volt, Dyna, and Sonic rebuilt me, I was fed to friggin' Bizarro clones! Eaten alive! Crorq: Jeepers? JEEPERS!? Getting eaten alive deserves much more than a simple "JEEPERS"! I'm the Chief of Police now! I may not have wanted it, but I'm your superior officer now and I demand your respect! Topman: But how did you become the chief! Crorq: What was left of me was found and reprogrammed. DUH! What did you think happened? The tooth fairy came and offered me this damned desk job? Dr. Light: Hey, now, all that's unnecessary! Crorq: NO! No, I .... (takes an unnecessary breath) Okay. Okay I'm good. I'm back in control. Police Bot: Is there a problem here? Crorq: No. Not unless you don't bring me more damned chicken wings! (kicks the box of bones at the police bot who scurries off to find more food.) I can only assume you wanted to know why we remade Bizarro's Gammas, eh? Crorq: Because it was a good idea! I was trapped in there too, remember? You whiners weren't the only ones! But I got over it. When we helped to refurbish the Technodrome we found some of the Gammas laying around (along with files on them in the computer). So, why not? Geminiman: Because they're made by our insane enemy! Crorq: Always whining! Do you see me whining here in my desk-job prison? DO YOU!? Police Bot: I got your chicken wings, sir! Crorq: I don't want them anymore! Get lost! Crorq: Good help is so damned hard to find. Crorq: Oh, shut up! You people ..... You think you have it bad? I was reprogrammed! Friggin' violated ..... they violated me! What the Hell have you people to complain about!? Crorq: My super-intelligent brain has put together this plan: You all deal with the mess you made or I put you all in robot jail for unleashing CHAOS in Monsteropolis! Dr. Light: .. Now, see here! Needlegal: ... Seriously need to work on your attitude! Crorq: I need Doritos! Get me some. NOW! Geminiman: I can't believe this! We've been taking orders from that guy? Dr. Light: Er .... you are taking orders from that guy. Geminiman: I can't believe this!! Hardman: He's the one guy I will never let into my bar. I don't care what kinda glutton he is, he's not gettin' in. Ever. He's disgusting. Geminiman: We're not taking this, are we!? Shadowman: He's the chief of police. What do you want to do? And besides, with knock-offs, Mecha-Energy, Frankenstein, Nightmare Topman, and the Rescue Force all out there, we need all the help we can get. Spark Chan: Look at it. It's really causing trouble. Magnetman: Regardless, we will prevail. Spark Chan: So, what's the plan? Magnetman: We're going to attack! We will use our powers to disrupt its energy matrix. Magnetman: It will succeed if we pour all our hearts and minds into it! Ikuzo! Magnetman: Mecha Energy! You will face me creature! And harm no more innocents! Spark Chan: No way, big guy! Magnetman: Now, Classi. Disrupt his energy with your own. Needlegal: Yeah, but nothing we're doing is affecting this guy! Geminiman: It's the Limited Armor! Damnit, Nightmare Top installed Limited in this thing! Shadowman: Yeah, that's it. Limited and probably our Transmetal 1 Armor too. And who knows if it's assimilated the bits it "ate" off Magnet. Needlegal: This thing's horrible! We've just been distracting it! I can't take it! Shadowman: Hh! I guess that physical damage adds up no matter how advanced the shielding is! Shadowman: There's no time to lose! Geminiman: Hey! No concern for your sister? Shadowman: *grunts* It revived. We have to destroy the thing's brain to kill it for good. Topman: These copies really creep me out. Hardman: Considerin' there's no copy of you, I'd say I have it worse, kid. Now, stand aside. Topman: You seem a little annoyed, Hard. Hardman: When the boss made these stupid copies, I was really pissed off. And now that they're everywhere, I'm even more pissed off. They're makin' me look bad. This is the worst mess the boss has ever made. Topman: Hm .... this place looks remarkably well-preserved. I can't believe this is some sort of fluke. Xelloss: (appears from out of nowhere) Of course it isn't a "fluke". The whole building fell apart! It was actually very hard to save this machine. Xelloss: Why do I always get that sort of reaction? Hardman: It was you!? What the Hell, Xelloss? Xelloss: Oh, I couldn't help myself, Mr. Hard. Things were just too ... peaceful lately. I thought it'd be nice to stir things up a little. Topman: And having Mecha Energy and that Frankenstein causing trouble all around the city wasn't enough for you? Xelloss: Hm. Maybe I went a little overboard with letting these guys roam wild. Hardman: We're demolishin' this place, Xel. I suggest ya step aside. Xelloss: My! Is that a .... threatening tone, I detect, Mr. Hard? That's a little rude. Especially when I've provided you with a solution to your little ... what was the name? Frankenstein? Your little Frankenstein problem. Hardman: And what solution is that, Xel? Xelloss: You know that Mr. Nightmare created that thing out there to be his new body, right? Topman: Yeah, I managed to figure that part out. Xelloss: Of course you did. Has it ever occurred to you that its feral nature makes it somewhat .... more dangerous? Perhaps it might be best to use .... "something" on-hand to give that thing a mind? Something that's controllable? Simple? Something you can outsmart...? Hardman: You wan' us to recreate Bizarro Shadowman by usin' one a' these copies! Topman: No way! No freakin' way! Hardman: Missing the point here, Xel! Xelloss: No, I think you're the ones missing the point. Your leader and friends are faring quite badly against that Frankenstein Mr. Nightmare made. They will die. Hardman: .... You're plannin' to take Bizarro away, aren't you? Xelloss: Oh my! Have I been that obvious? Hardman: We won't do it, Xel. Xelloss: Remember, Mr. Hardman, you owe me! * Without my help you would have never made it to Mr. Juno. And where would you all be then, hm? Or your precious planet Earth? Topman: And why don't you do it, if you want it so badly, Xel? Hardman: 'Cause Frankenstein eats things, Top. Xel here is obviously 'fraid ta get scarfed down. Xelloss: Such speculation! Let's just say I'd rather you do it. Believe it or not, you're not the only people I have to see today. Topman: We can't just recreate our number one enemy! Hardman: We owe him, Tops. Hardman: We gotta report this ta the boss. Shadowman: ... I understand. We do owe Xelloss. Geminiman: What!? I can't believe this! Topman: What's wrong with Needle? Shadowman: She hit Frankenstein with all she had and now she's drained. Topman: So Xelloss wasn't kidding ... you guys really are in trouble! Spark Chan: This thing's just adapting to every attack we hit it with! Even if we beat Frankenstein we'll never beat this thing! Snakeman: Hm. Well, you know I'm occupied .... but it seems to me like you might be somewhat overanalyzing the situation. Magnetman: That's .... a great idea. Shadowman: (While taking a hit from Frankenstein's energy attack.) *UFF*! It's worth a try. Let's do it. Shadowman: Just ... stay close to Frankenstein and get ready. Hardman: With one of your copies .... are you sure this is okay? Hardman: Sorry for ruining yer advice, boss. Topman: Well, it's working! It's disassembling the Shadow Copy! But do you really think it'll integrate its mind into its systems? Xelloss: I'm willing to bet on it. Xelloss: Me! Oh, don't get up. I know how tired you all are. Xelloss: I'm here to make sure this thing goes off without a hitch. Beastmaster wants Bizarro as a new general and what Beastmaster wants, Beastmaster gets! So I'll have no interference from the peanut gallery. Shadowman: Interfere with this, Xel! Xelloss: You owe me, Shadowman! It's pretty bad for you to renege like this! Xelloss: No one likes a debter, Mechanical Maniacs, especially not me. I will get what I'm owed. Geminiman: Just try to blow me away! Xelloss: And risk damaging my new warrior? I think I'll just dispose of you personally. Xelloss: What? Did? You? Do? Topman: Hey, you can't get too mad. We did hold up our end of the bargain. Topman: (whose "ears" are burnt and charred) That we did. You told us to use one of the copies to stop Frankenstein. And we did that. And for one brief, shining moment, Bizarro Shadowman was reborn. If you were quicker you might have been able to have him as one of your people. As it stands, you just didn't act fast enough. Xelloss: Oh, so that's how it works, eh? Topman: One good turn deserves another. Xelloss: Mwah ahah hah hah hah! I suppose you're right! Well, well, well, it does look like you've pulled a fast one on me. Yes, I think I'll remember that one. Xelloss: One good turn deserves another. Doc Robot: It's almost done! As those simpletons go after diversions it shall be the Rescue Force who is triumphant! Expressman: I gotta admit, this was one sneaky plan, Doc. Wily will be thrilled to have all his criminal records expunged. Multiman: As well as the money you got wired to his account. Heh heh heh .... it may not be my style, but I gotta admit I like this idea. Barrageman: Unit Barrageman doesn't care! Unit Barrageman wants to destroy! Doc Robot: Patience! With viruses in the system, Master Wily will soon rule .... eh? Doc Robot: System appears to have been hacked! Doc Robot: Analyzing binary code displayed on screen. It says ... "Nice try. Love, Snakeman." Geminiman: I still can't move! Hardman: And I'm still missin' half a' my body! Cassandra and Gag'll kill me for leavin' them on bar duty alone! And ya never actually found out where Doc Robot ran off to, ya just made a virus ta get at him after figurin' out his plan. Needlegal: Most of me is gone! And after all the time I spent making my armor look pretty! Spark Chan: My power Core's totally shot. I'm on life support until they make me a new one! Magnetman: And Doctor Light doesn't even seem to want to repair me. How long will I be stuck with these quick replacements for the limbs eaten by that creature!? It's unnerving! Topman: And Xelloss looked really pissed off before he left. Snakeman: What I'm trying to say, is that what doesn't kill us can only make us stronger. Hardman: *grunts* We're robots, Snake. We get stronger by gettin' upgrades. Magnetman: Being human wasn't this annoying. Spark Chan: Just think of it this way: if you were still human you'd be dead now. Magnetman: Well, there's always that. Needlegal: And don't forget, we learned something too. Needlegal: We learned that Crorq is the chief of police! I mean ... who saw that coming? Shadowman: I don't care at all. Hardman: I need a drink. Oh wait ... HALF OF MY BODY'S GONE! SO I CAN'T DRINK! Crorq: DON'T YOU DARE TURN ME DOWN AGAIN! I AM THE CHIEF OF POLICE AND YOU WILL RESPECT ME! Topman: Well, until we topple Crorq from his high horse, we are ..... The Mechanical Maniacs!